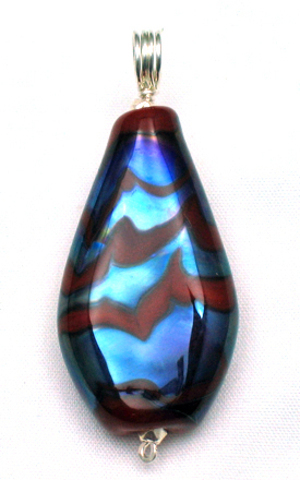 This flat diamond shaped lampworked bead was made with a deep purple/red glass. Spirals of glass high in silver content were wrapped around the base bead, manipulated with a pick, and melted in before re-shaping and flattening the bead. Varying the torch settings after the bead was shaped produced the silver/blue sheen in the decorating glass spirals.